There are many possible ways to reduce housing costs but some are much better than others. A cheap house is not truly affordable if located in a sprawled, automobile-dependent area with high transportation costs, and households can rationally spend more than is generally considered affordable for a house located in a walkable urban neighborhood where they don’t need a car. True affordability therefore requires policies that increase affordable-accessible housing. Many cities have a shortage of such housing, forcing low- and moderate-income households to spend more than they can afford. 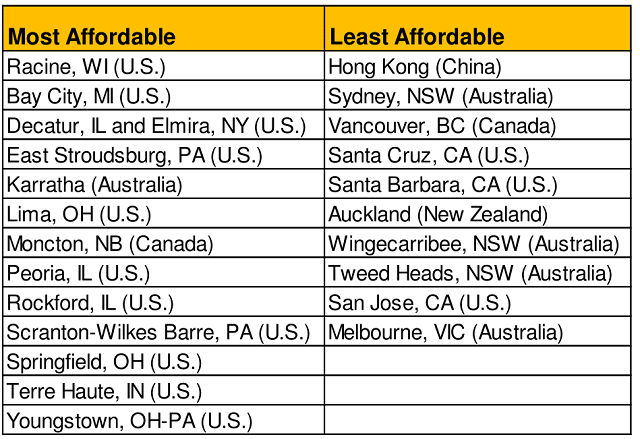 The recently released 2017 International Housing Affordability Survey (IHAS) finds that housing costs are excessive in many cities. This is indeed a serious problem, but the solutions they recommend, which consist primarily of sprawl, would further harm many lower-income households. Much better solutions exist. Affordability refers to a household’s ability to purchase basic goods such as food, clothing, shelter, transportation and healthcare. 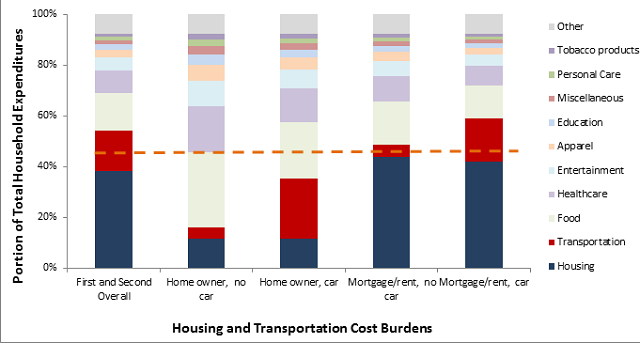 In the past, affordability was often defined as households spending less than 30 percent of their budgets on housing, but since households often make trade-offs between housing and transportation costs, many experts now recommend evaluating affordability based on lower-income households’ ability to spend less than 45 percent of their budgets on housing and transport combined. The following two graphs illustrate the problem. The first shows the portion of household budgets devoted to various goods. 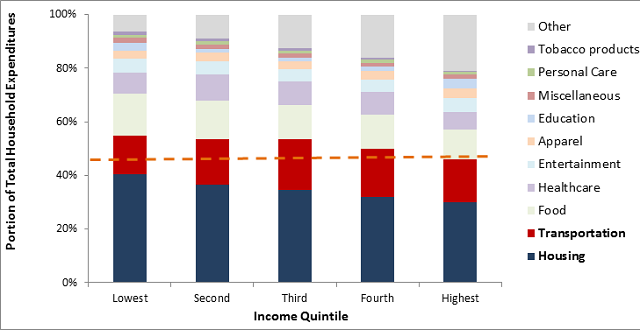 Apart from the highest quintile, all income categories spend more than 45 percent (indicated by the orange line) on housing and transportation. Of course, these cost burdens vary depending on household circumstances. Since approximately a third of lower-income households own their homes and a quarter don’t own vehicles, these average statistics understate the cost burdens on those that pay rents or mortgages and own cars. The second figure shows spending by lower-income households (average of first and second income quintiles), assuming that home-owning households spend 70 percent less on housing, and car-fee households spend 70 percent less on transportation, than overall averages, and with adjustments to other spending based on their budget. This indicates that lower-income households that pay rents or mortgages and own a motor vehicle devote approximately 60 percent of their budgets to housing and transport, approximately 30 percent more than is considered affordable. The cities it categorizes as the least affordable are attractive, economically successful and geographically constrained coastal cities, while all those that expanded their residential areas are unconstrained, inland urban regions. I’m sure they are nice places to live, but are inappropriate models for increasing affordability in large, economically successful, rapidly growing cities. It makes no sense to suggest that constrained cities such Sydney, Vancouver and Hong Kong can become affordable by expanding like unconstrained cities such as Decatur, Racine and Springfield. Geographically constrained cities must grow up, not out. The key to affordability in geographically constrained cities is to allow more affordable infill housing by reducing restrictions on compact housing types (townhouses and multi-family housing) and eliminating minimum parking requirements. The IHAS argues that high housing prices are caused by urban containment boundaries that limit urban expansion, but researchers who examine this conclude otherwise. A detailed study found that, in fact, few U.S. jurisdictions have effective urban containment boundaries but virtually all restrict affordable infill by requiring large size parcels, forbidding multi-family housing in residential neighborhoods and imposing generous minimum parking requirements, which reduce housing affordability and density. Most other countries have fewer restrictions on urban infill, greater affordability and higher home ownership rates. Sprawled cities have significantly higher transportation costs than their compact counterparts, something that the survey disregards. These costs are illustrated by recent analysis, summarized in the table below. It compares the United States’ 25 largest compact cities and 25 largest sprawled cities. Compact city households devote an affordable 40.4 percent of their budget to housing and transportation, compared with sprawled cities’ unaffordable 49.9 percent. This can be explained by the sprawled cites’ much lower Walk Score ratings and higher automobile commute mode shares, which require most adults to own a personal automobile. Compact city residents have more affordable transport options, offering thousands of dollars in annual transport cost savings. Of course, not every household takes advantage of these potential savings. Many spend more on automobiles than is essential, for convenience or status sake, but having the ability to reduce vehicle ownership and associated costs can significantly increase affordability. The IHAS argues that sprawled urban regions are more livable due to increased affordability and reduced traffic congestion. This is not entirely true. Sprawled community’s lower single-family housing cost are often offset by higher transportation costs, resulting in lower overall affordability, and although more compact cities tend to have more intense traffic congestion, this is more than offset by shorter average trip lengths and lower automobile mode shares. As a result, compact city compact development tends to reduce congestion costs overall. For example, a major Phoenix, Arizona study found that residents of older neighborhoods with more compact and mixed development, more connected streets, better walking conditions and better public transit services experienced less congestion and spent less total time traveling than did residents of newer, lower-density, automobile-dependent suburbs. Urban residents’ commute trips averaged about seven miles and shopping trips three miles, compared with almost eleven and four miles, respectively, in suburban areas. There are additional costs of sprawl including higher infrastructure costs, higher traffic fatality rates, higher rates of obesity and associated health problems, reduced mobility options for non-drivers and associated increases in drivers’ chauffeuring costs. Analyzing 2,500 Latin American municipal budgets, Rico and Solé-Ollé found that in urban areas with less than 25 residents per acre, each 1 percent increase in per capita land area increases municipal costs by 0.11 percent. Similarly, de Duren and Compeán found that per capita municipal water, sewage and garbage collection costs in Brazil, Chile, Ecuador and Mexico tend to be minimized at a relatively dense 90 residents per hectare. This indicates that public services tend to be most efficient at densities of 40-100 residents per hectare within or adjacent to existing urban areas. Compact development typically reduces the costs of providing a given level of public service by 10-30 percent compared with sprawl. Misguided public policies can drive up urban housing prices and reduce overall affordability, including restrictions on housing density in urban neighborhoods, the commodification of housing and urban fringe housing development. 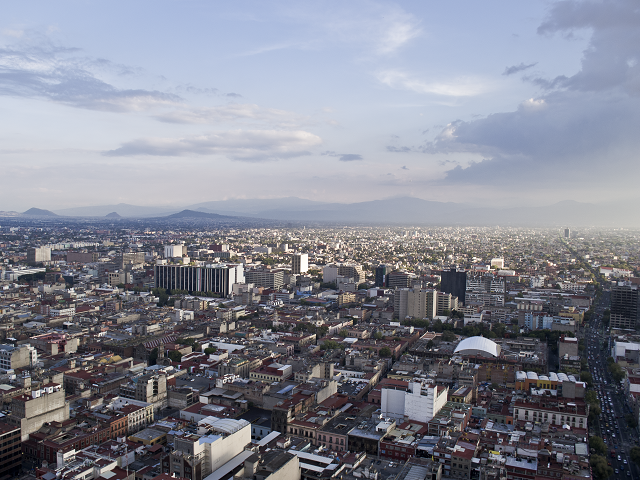 For example, Mexico’s federal housing finance policies encourage development of inexpensive housing in automobile-oriented urban fringe areas, which caused residents to significantly increase transportation costs compared with housing in more accessible, multi-modal neighborhoods. Sprawl reduces overall accessibility, which decreases employment opportunities, particularly for economically disadvantaged people. Upward mobility is significantly higher in compact areas than sprawling areas. This results from better job access and less income segregation in more compact areas. More compact development can also help households generate more long-term wealth by allowing them to shift spending from vehicles, which rapidly depreciate, to housing, which tends to appreciate in value. Choosing a home in a walkable urban neighborhood rather than an automobile-dependent, urban-fringe location can typically provide a household with about US$6,000 in annual transportation cost savings, which can finance about US$100,000 in additional housing investment. A household can build an additional US$65,000 in equity in a decade by choosing a more expensive urban home that requires less spending on transportation instead of a cheaper house at the urban fringe with higher transportation costs. This is not to suggest that cities should never expand, but, to be resource efficient and maximize overall accessibility, the expansion must be compact and multi-modal, with good walking, cycling and public transit in order to maintain transportation affordability.